M-HEAL initiated the SANA program in 2015, with the intention of providing students with the opportunity to volunteer abroad and gain needs assessment experience. 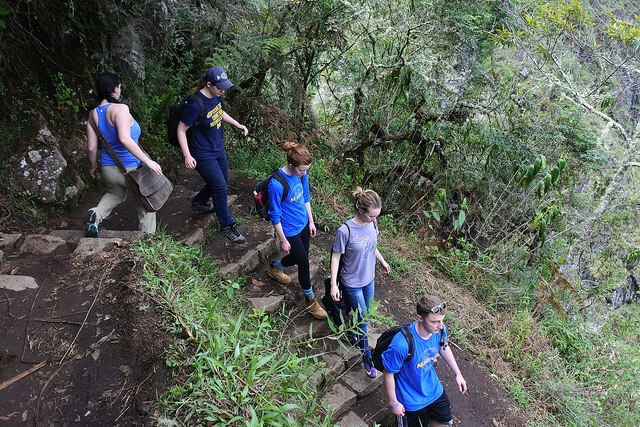 Typically, 16 - 18 students travel to a Latin American country, stay in a home stay, and volunteer in medical campaigns in schools and community centers. Students travel over Spring Break and spend significant time working to understand the culture of the country, planning the focuses of their needs assessment, and preparing for the trip. While on the trip, students spend their days volunteering in clinics, and convene in the evening to discuss their observations. Students may decide to start a project team based on their needs assessment. Applications for the trip open in the fall. This year’s SANA program volunteered through Máximo Nivel and lived in a lovely homestay in Cusco, spending the week setting up free clinics all around the city while seeing over a thousand patients in five days. The group assisted the doctor each day by taking vitals and demonstrating proper handwashing and dental hygiene. During the days at the clinics, the group was able to interview the doctor as well as the locals about the medical needs of local communities as well as the challenges of the Peruvian healthcare system. After volunteering, the fourteen SANA travelers were able to explore the cities of Cusco and Pisaq, and on their last day in Peru, the ancient city of Machu Picchu! This year's SANA program volunteered through Maximo Nivel in Antigua, Guatemala. 16 students stayed in a homestay, and they worked in shifts to volunteer in mobile clinics. During each shift, students were responsible for entertaining children (if the clinic was at a school), handing out anti-parisitic medication and vitamins, shadowing the doctor, and handing out toothbrushes and toothpaste, and demonstrating proper handwashing techniques. Additionally, all students took detailed notes and observations of practices in the clinic as valuable needs assessment data. Each evening, the group came together to discuss observations made throughout the day, and they wrote needs statements and problem statements based on the data they acquired. They also generated interview questions to delve more deeply into observations made during the day. Students were able to interview the doctors as well as interested patients at the clinics. The SANA travelers also explored Antigua, and visited Cerro de la Cruz, as well as Volcan Pacaya.